The packaging of every modern DocuPrint series seems almost never changed from time, because it is always present in a white bandage in a compact package, as well as the DocuPrint P115w. Printer class entry-level that only rely on printing capabilities, but no doubt have a pretty good quality resolution up to 2400 x 600 dpi. A simple working system with a fairly cheap price, DocuPrint P115w also back equipped by head-print technology mainstay Fuji Xerox, namely S-LED. Technology deliberately presented to manipulate standard printer performance to be equivalent to laser printer, but without involving the concept of excessive devices in order to still get the best cost efficiency. The result, the price is affordable but the performance can exceed expectations up to 20 ppm. 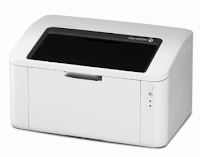 As the device is still based on mono print needs, DocuPrint P115w does not have so many redundant features in this device, except for the presence of a wireless system. One feature that appears to be required in every DocuPrint to keep its consistency as a modern printer, while making it easier for users to apply their prints. Users only download Fuji Xerox Print & Share application from the app store, then immediately print activities that users want will be realized. Continuing to the maintenance system, DocuPrint P115w does not seem too much trouble. Firstly, if the ink capacity of DocuPrint P115w is running low, the user can activate the "Toner Save" mode for printing needs under minimal ink conditions. Second, DocuPrint P115w has a high enough recycle rate up to 10,000 pages per month, so if the use of DocuPrint P115w not excessive then the user need not worry with his head condition.